With its recently-completed $1 billion expansion to the University of Southern California (USC) in Los Angeles campus, the architecture firm Harley Ellis Devereaux (HED) has taken a definitive stance in the ongoing debate over resurgent neo-traditionalism in architecture by cloaking a strikingly contemporary complex behind filigree and lace. The 1.25-million-square-foot USC Village is spread across six Collegiate Gothic–style buildings on a site occupying the former University Village, a 1960s-era student-geared retail site that was recently purchased and torn down by the university. 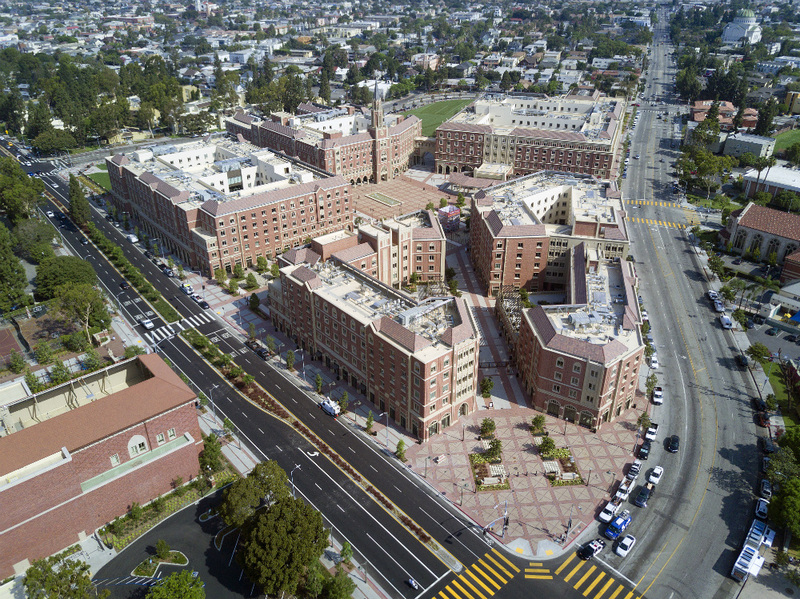 The new USC Village houses eight residential colleges, an 8,000-square-foot dining hall, a campus power plant, 130,000-square feet of retail spaces, and 2,500 beds of student housing spread across a six courtyard structures that surround a collection of retail-lined plazas and paseos. Initially, USC planned to have a traditional developer sign a long-term lease for the right to build on the site. The arrangement would have probably yielded, according to Mark Skiles, project architect at HED, a typical stick frame commercial complex designed to last only long enough for the developer to net a profit. Instead, the university opted to develop the property for itself, treating the project not just as a shiny and new student amenity, but as a full-fledged campus expansion. The change in vision resulted in a conceptual shift for the architecture, as well. “These are 100-year buildings,” Skiles explained while touring the site with The Architect's Newspaper (AN). “They are concrete frame construction.” The shift in construction technique—which comes with a slew of particular qualities different from those of stick frame construction—results in significant shifts to the prototypical architectural qualities of the complex. For one, the buildings stand taller and prouder than would normally be the case: concrete construction typically yields floor-to-floor heights of 10 feet, 9 inches that net dorm dwellers roughly an extra foot of overhead space over traditional stick frame construction. This results in taller buildings, overall. The 60-foot-tall blocks cast deep, cooling shadows on the hardscaped spaces between the buildings. Los Angeles–based landscape architecture firm RELM—formerly Melendrez—has successfully planted these areas with fine sycamores that will grow to stately heights in coming years. A central bosque adjacent to the main plaza—which will eventually be populated with benches and umbrellas—serves to cool the main square and aligns with one of the university’s main axes, mirroring the tree allées across the street on the main campus. The construction method is also reflected on the building’s panelized facades which were manufactured offsite and craned into place. The brick veneer-faced panels were fabricated by contractor Hathaway Dinwiddie in reverse order, with a layer of ⅝-inch brick veneer arranged in a mold that was then filled in with cement. The architects designed 80 unique panel types for the project. Protrusions covering the facades—sandstone-colored concrete tracery, window aprons and frames, and swept cornicework—serve to hide the seams between each panel in plain sight. The stylistic treatment—a requirement set by the client, who wanted to instill a sense of “history” on the 137-year-old university—elaborately invented as it may be, is a tour de force in contemporary construction practices. As such, sometimes these efforts are a bit ham-handed, especially along many of the windows, where awkward, cross-shaped concrete muntins stand proud of run-of-the-mill window frame assemblies. This detail of “old” architecture physically draped over modern construction is repeated throughout the complex, to sometimes great effect. The entry sequence at USC Village on Hoover street—the main community and parking entrance—suffers, however, from the blended approach. There, a large, overwrought gothic triumphal arch swallows cars underground, effectively disrupting the sidewalk with its wide ramp. The move is congruous with the university's uneasy community connections, including the need to close off and secure the campus. The omnipresent gates and entry kiosks can lend a hostile nature to the overall scheme. In other places, however, the details shine by deploying a consistent material and tectonic methodology that renders a great deal of relief to each facade and throughout the complex. The sandy-colored arched colonnades lining the courtyard, for example, are supported by the structure’s real concrete columns, not hollow concrete veneer tubes as might be the case in typical revivalist construction. 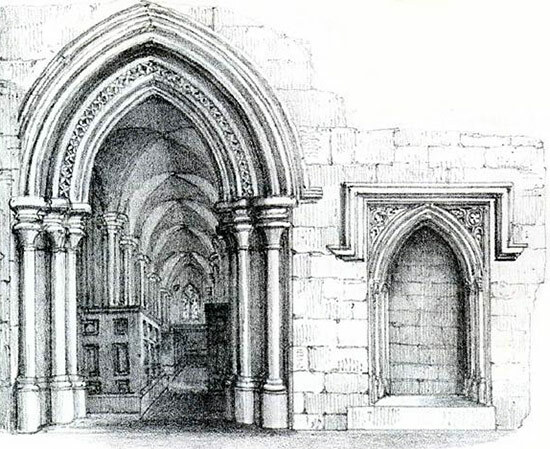 The over-sized arches rest on squat, 18-inch thick Romanesque-style columns that were cast in circular footprints in order to be expressed in an evocative style, simultaneously revealing and obscuring the true scale of the building’s structural system. Behind the concrete panel arches above, furred-out soffits contain prosaic components like lighting and sensors that terminate in expanses of curtain wall. Like other aspects of USC Village, what you see is what’s there—the architects make little effort to hide the contemporary nature of their buildings. The aesthetic treatment for the project is interesting because it combines, in bits and pieces, symbolic elements of its derivative style from primary and secondary sources alike. The mess hall, which features a soaring wooden roof studded with dormer windows, for example, is inspired equally by Christ Church at Oxford University and Hogwarts Castle, according to the architects. The blend is not necessarily notable given the Los Angeles context, where historically-speaking, paper and white-wash pass for architecture more often than not. It is inventive nonetheless because those vernacular proclivities are blended by the designers toward creating a built language that is rooted not simply in image-based reference, but in surface relief and construction detail alike. Here, for example, lateral structure convincingly populates the ceilings of the clear-span space, adding detail and texture despite the chunky candelabra and the building’s overall squat proportions. Successful too are the student lounge courtyards that punctuate each residential college. Decked out in trees and planters, the spaces feel comfortable and useful all at once and provide necessary social and green spaces accessible to dorm rooms. Again, when the trees grow in, these spaces will be beautiful. Overall, the complex works as an exploration of how traditional style can be explored with a contemporary construction vocabulary. Regardless of whether the buildings lend today’s USC an air of much-sought “history,” one thing is for sure: like the original examples of their style, these Collegiate Gothic edifices will be around for a long time. Reyner Banham, in his 1971 Los Angeles: The Architecture of the Four Ecologies, chose to view L.A. as an interwoven network of ecological systems: freeways, suburbs, mountains, and beaches. This urban expanse, even in the 1970s, was not only a landscape radically different than what people of Banham’s time had seen before, but more importantly, presaged the prevailing type of urban geography that would become a defining characteristic of the late 20th century and beyond. This new type of urban region, where the lines between and among the city, its suburbs, and nature are increasingly blurred, defines the so-called “megalopolises” of today. With Banham’s Los Angeles in mind, landscape architects, geographers, and researchers came together at University of Southern California (USC), under the direction of Kelly Shannon, director of the USC School of Architecture's Landscape Architecture Program, and USC assistant professor Alison Hirsch, for the Landscape as Necessity conference September 22–24 to focus on issues relating to the connections among megalopolis, nature, and the future of both on a rapidly warming planet. The three-day-long conference was built around the idea that the landscape architecture discipline is, as stated on the conference website, “uniquely able to synthesize ecological systems, scientific data, engineering methods, social practices, and cultural values, integrating them into the design of the built environment.” It was organized around six prevailing themes: “Preemptive Territorial Design,” “Cultural Agency,” “Water Urbanism,” “Landscapes of Infrastructure,” “Productive Landscapes and Food Security,” and “Energy Fields.” These topics point to the ever-expanding mantle the landscape architecture discipline has increasingly embraced in recent years. This positioning has enabled landscape architects to achieve a new level of prominence in society, both in the rapidly urbanizing areas of the world and in legacy cities, where urban renewal, post-industrial society, and climate change mitigation are being harnessed in an effort to make cities more equitable and sustainable. These considerations come heavily into play in the work presented at the conference, which was broadly based and featured research and projects from around the world. One panel discussion, called “Resource and Risk,” mined the generative potential of “resource-strained geographies” and featured the work of Miho Mazereeuw, director of the MIT Urban Risk Lab, Eduardo T. De Mesa, chief of the Planning Division at the Los Angeles District of the United States Army Corps of Engineers, Kristina Hill, associate professor at University of California, Berkeley, and Gerdo Aquino of Los Angeles–based SWA landscape architects. Mazereeuw presented research from her project “Risk Ecologies– Haiti Evacuation System,” a complex and multivalent study of the currently practiced strategies deployed in Haiti to adapt to the region’s many climatic and social struggles. Aquino presented his firm’s work for the Sava Promenada in Belgrade, Serbia, a project that introduces a one-kilometer long, variable urban waterfront that accommodates seasonal river flooding the Sava River. 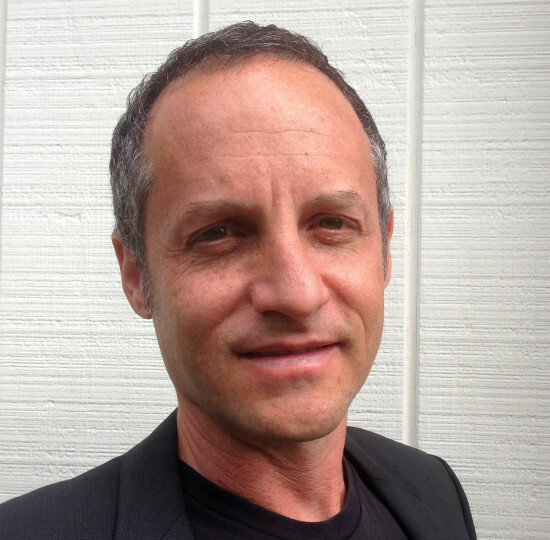 Aside from panels, the conference featured paper presentations, such as “Preemptive Territorial Design, Energy fields, Infrastructures,” and showcased work from experts such as, Barry Lehrman, assistant professor of Landscape Architecture at California State Polytechnic University Pomona, who presented a substantive hydrological analysis of his Los Angeles River research. It also featured work by Bradley Cantrell, a Harvard-based researcher who presented the robotic modeling techniques his team uses to create abstracted sediment simulations for riparian landscapes and that of Yusuf Zoheb Nazerali, an architect, landscape designer, and educator who presented his urban design project “Basha Wolde Chilot” for the city of Addis Ababa, Ethiopia, that seeks to stitch together old and new parts of the city through landscape infrastructure and economic re-orientation. Clifford Pearson, deputy editor at Architectural Record, is leaving his post to join the University of Southern California's (USC) School of Architecture as Director of the American Academy in China (AAC). The AAC was founded in 2007 by USC School of Architecture Dean Qingyun Ma. The program uses the humanities, art, and architecture to understand contemporary China. In addition to directing the AAC, Pearson will teach a class on architectural journalism at the academy. 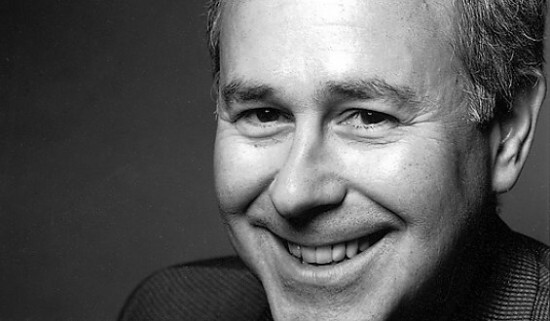 He will assume his new role in January 2016, though he will continue at Architectural Record as a contributing editor. Why China now? Pearson explains that, because China's building boom is slowing down, this is an ideal time to "catch our breath and examine what's happened over the past 25 years." Currently, the AAC is a six-week summer program open to U.S. and Chinese students. Its programs are geographically far-reaching and immersive: this past summer, students from 12 universities traveled to Shenzhen, Beijing, Xi’an, and Lushan to study how the mass migration from the countryside to the city has influenced the rural-urban dynamics across China. Pearson would like to enhance AAC's profile among university students in these two countries by expanding the academy into a year-round series of seminars, lectures, and events in Los Angeles and cities throughout China. Pearson envisions the AAC as China's answer to the American Academy in Rome. Similar to the AAR, there will be fellows living on site and working on China-focused research projects. Pearson was tapped for the role because of his expertise in the culture and development of China. From 2005 to 2013, he was editor-in-charge of Architectural Record China, and he is currently co-director of the Asia Design Forum, a think tank that fosters debate around the built environment. He intends to use his "journalist's eye" to create programming that contextualizes and critically examines China today. 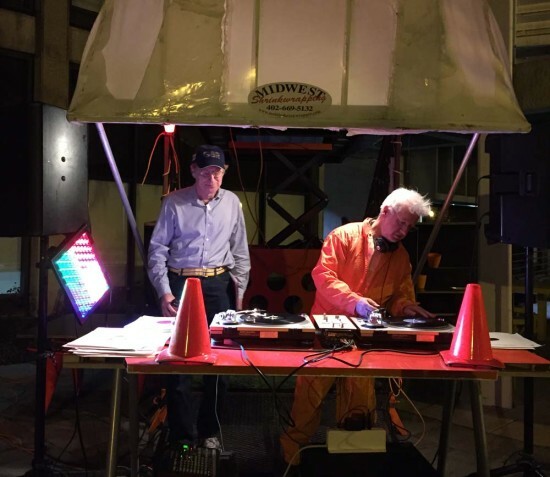 Last week, the courtyard of the University of Southern California (USC) architecture school served as a parking lot for two fascinating pieces of auto/architecture by architects Jennifer Siegal and Mark Mack. Siegal's piece, Aero, is composed of a small Taylor-Dunn electric truck attached to an unfolding and cantilevered unit load device, wrapped with sail material, that can be used for meetings and even lodging. Mack's, entitled S/LMP, combines a towing trailer with a DJ booth, a scissor lift, kitchen, and two shrink-wrapped clamshell covers that look like a giant takeout container. They are part of a traveling show, Truck-A-Tecture, that combines prefabricated architectural solutions with the mobile culture of trucking (food trucks, mobile homes, big rigs, etc). The vision, say the creators, is one of "efficient and sustainable housing" combined with "the reality of nomadic contemporary lifestyles." Siegal calls the hybrid solutions "industrial upscaling," suggesting new portable architecture uses for our increasingly mobile society. Other participants besides Siegal and Mack include Jeff Day and Wes Jones, who developed an inflatable shelter and a solar paneled prefab R/V, respectively. The show appeared at Kaneko, an art center in Omaha, Nebraska, last summer. Look for Truck-A-Tecture in other venues soon. 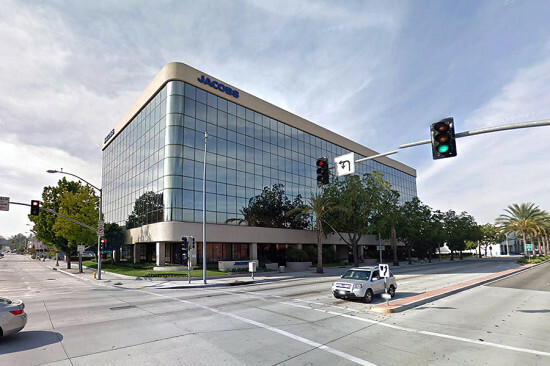 Word has it that Art Center, which seems to already own all of Downtown Pasadena, has just bought the area’s massive Jacobs Engineering Building. Also on the move, USC Dean Qingyun Ma has relocated his firm’s offices to none other than Downtown LA’s Bradbury Building. How’s that for pressure? And we’ve learned of the initiation beverage of our favorite architecture-related women’s drinking and discussion group: Denise Scotch Brown. What group would Venturi inspire? We shudder to think... Something about Vermouth? USC president Max Nikias is curious. Since taking over in 2010 he has held the torch for past president Steven Sample’s beloved “California Romanesque” style on the campus, resulting in the red brick and tight arches of buildings like AC Martin’s Ronald Tutor Campus Center and George Lucas’s School of Cinematic Arts. Now he’s shifted a few years in the future to Collegiate Gothic. AC Martin has been commissioned to design a Gothic-style building for the business school, and other firms are competing for a similar project, we hear from our moles. Perhaps he will move into French Renaissance next? Get ready for some chateaux! Once again the courtyards at the USC School of Architecture are bubbling with installations as part of the second-year 2b studio, in which several teams of undergraduate students design and build structures in a very short period of time. Perhaps the most striking is the shimmering pavilion created by the 14-student class of professor Roland Wahlroos-Ritter. The studio focused on glass' structural, reflective, and refractive qualities. All of those attributes are apparent in the installation, in which 800 translucent and triangular polycarbonate pieces (actual glass was deemed too expensive and time-consuming) were folded like origami and zip-tied together. Each piece was drilled with several holes and inserted with vinyl tubing to reinforce the connections. In fact, the model for the structure was made with paper, then translated into its new, highly refractive form. 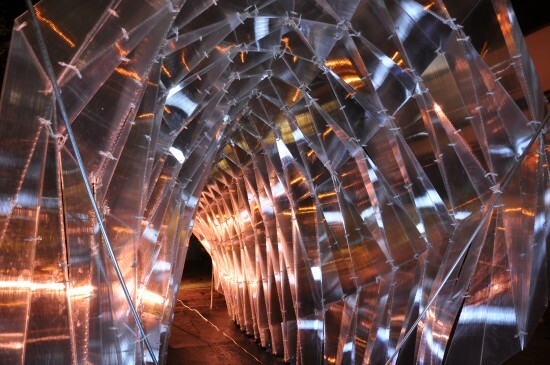 The installation was brought to the site in five segments and then pieced together on site. The students see this as a 1:1 prototype for a future pavilion to be built in glass. As confirmed on its blog yesterday, the Los Angeles County Museum of Art (LACMA) has made a proposal to acquire the Museum of Contemporary Art in Los Angeles (MOCA). "Our chief desire is to see MOCA’s program continue and to serve the many artists and other Angelenos, for whom MOCA means so much," said LACMA director Michael Govan in an online letter. Reportedly LACMA would preserve MOCA's two buildings, located on Grand Avenue and in Little Tokyo in Downtown Los Angeles. According to the LA Times, the offer was made back on February 24. As part of the arrangement, LACMA would raise $100 million for the combined museums as a condition for completing the deal, according to their story. Another suitor for struggling MOCA is the University of Southern California (USC), which has been reported to have been in talks to merge with MOCA as well. 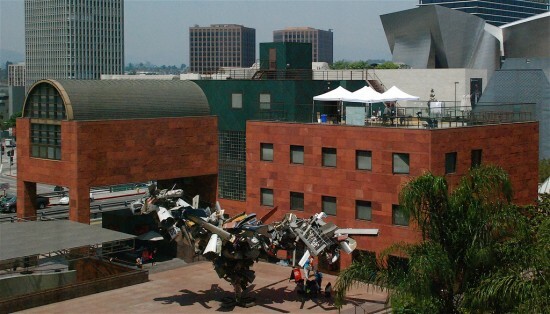 That arrangement has a model in UCLA, which is partnered with the Hammer Museum in Westwood. Either way, it looks like something has to be done about financially-troubled MOCA: “If not us, who?” Mr. Govan said in an interview with the New York Times yesterday. In the interest of getting students to build physical things, three years ago, USC introduced Top Fuel, a week-long design-build workshop accompanied by lectures, exhibitions, and panels. This year's workshop, "Filters Funnels Flows," wrapped up earlier this week. It focused on pneumatic (aka inflatable) structures, teaching students about the "inseparable relation between form and performance of pneumatic systems." Indeed, produce the wrong form here (or material, or structure) and the piece doesn't inflate. Students also explored lighting, temperature, and other environmental issues. Student teams of eight produced three different structures. 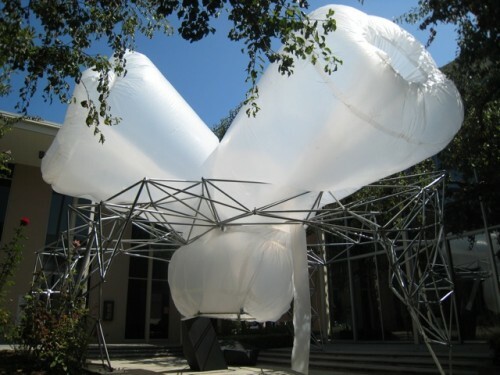 The first, "Sheer Pressure," located on the lawn in front of Watt Hall, was constructed with pneumatics sewn into a double-skinned fabric dome. 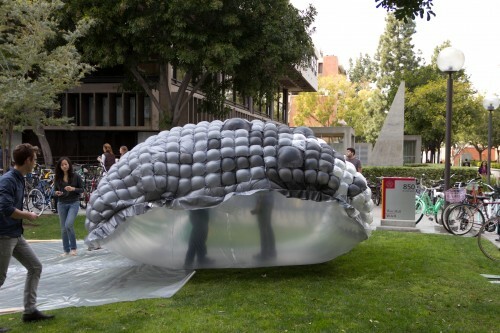 The second, "cellul/arch," located inside the courtyard of Harris Hall, featured a tensile structure using lozenge-shaped inflatable bladders to create a structural skin. The third, "Pneus Bridge," made up of a series of linked pneumatic tubing cylinders, rose over a pedestrian bridge between Watt and Harris Halls. 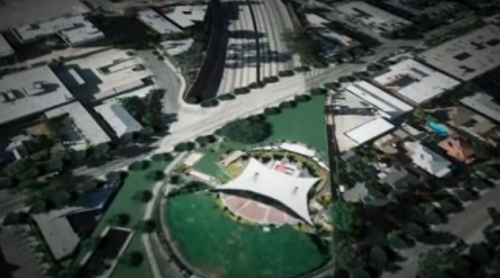 LA’s proposed 44-acre Hollywood Central Park, which would be set atop the capped 101 Freeway between Santa Monica and Hollywood boulevards, made new friends in Washington last week, according to the LA Daily News. U.S. Transportation Secretary Ray LaHood met with local congressman Adam Schiff and Friends of the Hollywood Central Park (FHCP), a non-profit formed in 2008 to raise funds for the park. LaHood expressed interest in the project, and provided insights on its development and possible benefits. He also offered to have members of his staff contribute to its planning process. As noted in the FHCP website, the park would be built on a deck constructed over the below grade portion of the freeway in that area, allowing easy park access from adjacent streets. FHCP stated that the “44-acre street level urban park allows us to rethink and reimagine our physical environment," adding that the final design would incorporate ideas developed by students at the USC School of Architecture's Master Landscape Studio. AECOM and The Olin Studio have also completed studies for the project. Park features would include “an amphitheater, walking trails, a dog park, a children’s playground, water features, recreational facilities and much more.” The AECOM feasibility study estimates the cost of building the park at $949 million; a more recent cost estimate by Psomas Engineering puts the total development cost closer to $1.15 billion. It's among several freeway cap parks proposed in the city. 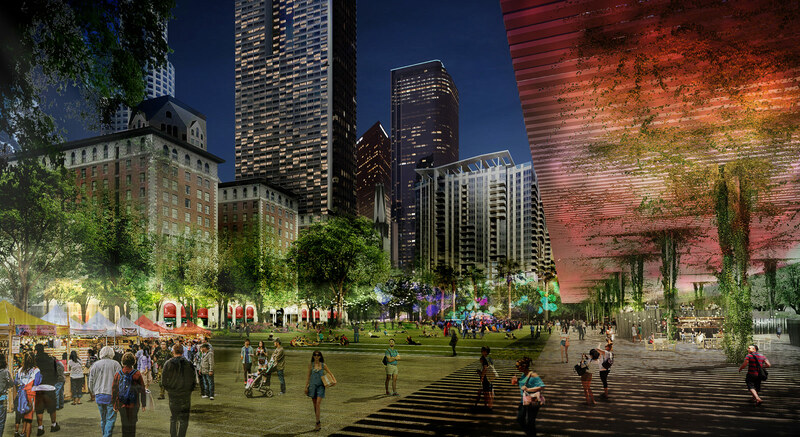 While $2 million in funding for the park’s EIR was approved by the CRA/LA Board in December 2011, the recent banishment of California's redevelopment agencies puts the funding in question. FHCP board members are working to resolve the issue and say they are moving forward with development. Once the EIR is completed, the feasibility report estimates that the park would take four years to complete. If you didn’t catch the giant inflatable pop-up chapel/igloo at Silver Lake's Materials & Applications gallery last year, now’s your chance to experience it in person. Well, it’s cousin anyway. The 25-foot-tall second rendition, Density Frames was designed by USC’s architecture director Gail Peter Borden for the school’s Religious Center courtyard. The irregularly-shaped balloon-like structure will be on display through December 15. Based on a baldacchino, a traditional canopy used in cathedrals, the ethereal, undulating installation is made from metal electrical piping and plastic drop cloths. Visitors can turn on the blower and watch puffy arms burst to life and sway in the sky as they ponder the effects of light, space, and form. According to Borden the piece was designed to “evoke a primal spirituality founded in our own perception and relationship with ourselves.” The project was fabricated by Borden and four other students over four weeks at a cost of $1,000. The exhibit is free and open to the public daily. A map of USC University Park campus can be found here.